I would like to present to you one of my original Pacham food recipes. If you’re curious watch Pachman means, it’s simply defined as Pachamba-chamba; a short way of saying Pachamba-chamba. Pacham is also known as Paswerte-swerte, in English, Palucky-lucky. If you’re lucky enough, then your Pacham recipe will taste really good! Here’s a picture of my first perfect cooked Fried Tuna with A1 Steak Sauce and Minced Garlic. I’m not an expert in making food recipes and I never made one before. Forgive me if I don’t know how to make a proper food recipe because this is my first time to make one. I’ll just enumerate the ingredients then tell you how to cook it. Actually, I just stir fried it until it was well-done. 11. After 10 minutes, check if your fried tuna is properly fried. 12. If you think your tuna is well-done, sprinkle some minced garlic onto it until you are satisfied of how your Garlic Fish Steak ala Jehzlau looks like. Yay! Soon, I will create a video version of this recipe to make my cooking technique more detailed. So watch out for it! That’s it! Was that easy? 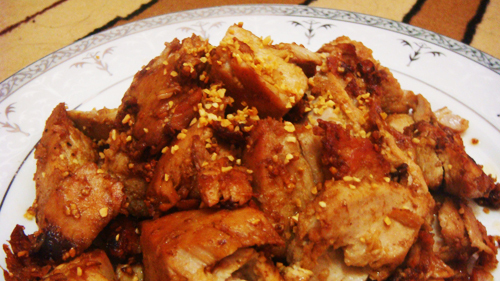 Cook your own Garlic Fish Steak ala Jehzlau now! This entry was posted by Jehzeel Laurente, who has written 19 posts as jehzlau, on Tuesday, March 3rd, 2009 at 6:18 pm and was filed under Original Recipes. @mhane wooooooot! anong oras dyan? pa luto mo kay tita chat yung recipe ko, masarap yan! hahahaha! 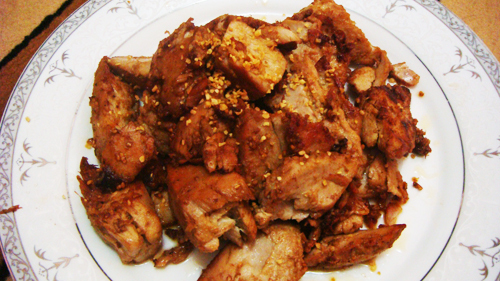 @Jaypee – gayahin mo recipe ko, masarap yan, di ka magCCC, yay! I would love to cook your recipe too but I am afraid that my pacham will not be as good as yours. Can I hire you? What is your current rate?